In order to qualify to have an emotional support animal one must be prescribed an emotional support animal by a licensed mental health professional. Both the Air Carriers Access Act (ACAA) and the Fair Housing Act (FHA) call for modification of (no pets) policies for emotional support animals. The Fair Housing Amendments Act of 1988 requires the landlord/property manager to make a reasonable accommodation to their policies and procedures allowing the tenant to have the emotional support animal. The Air Carriers Access Act allows for mentally or emotionally disabled persons to be accompanied on flights by an emotional support animal. At USA Service Dog registration we have helped thousands of families qualify for emotional support animal for their families. 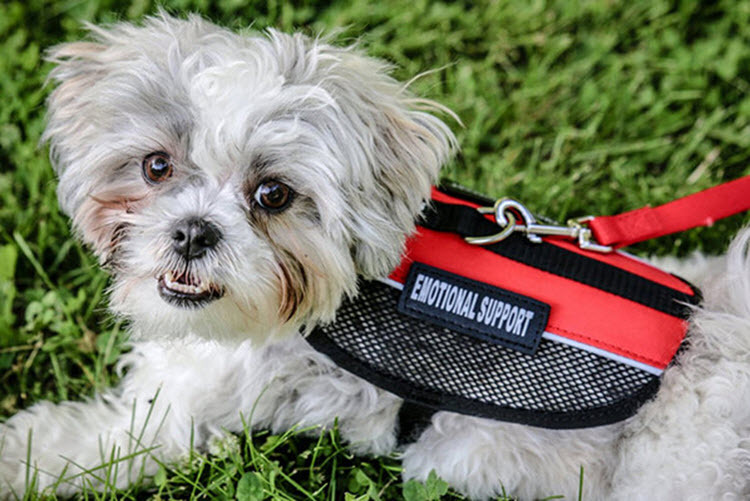 What Does the Emotional Support Animal Law Allow? In most cases landlords and airlines will accommodate an Emotional Support Animal but there are certain cases where they may not. Below are some examples where they may not accommodate your emotional support animal. Both hotels and motels do not fall under the Fair Housing Act for ESA’s and are considered public places and fall under the American Disability Act and are only required by law to accept service animals. At USA Service Dog Registration we have helped thousands of families qualify for emotional support animals. You can simply qualify by filling out our online form and one of our licensed therapists will review your case and issue an emotional support letter. What if My Landlord or Airline Wants to Verify my ESA? One of the benefits of working with USA Service Dog Registration is we will have your file online that can be retrieved 24/7 by simply inputting your 10-digit registration number in addition to receiving a prescription from one of our licensed therapists. These laws require your landlord or airline to accept the letter and other credentials you receive from USA Service Dog Registration. If the Landlord or Airline doesn’t want to accommodate your emotional support animal they are discriminating against a disabled person and are in violation of federal law. They can’t require a pet deposit or fee for accommodating the emotional support animal, even when the landlord or manager requires other tenants to pay a pet deposit. Inquire about the extent of the person’s disability, or ask for detailed medical record. The landlord or manager cannot refuse to accommodate your animal because their insurance policy won’t allow a species, breed or weight limit of the ESA. Training Status	My Dog is "Trained Service animal" My Dog is "Service Dog in training" My ESA Dog has passed "basic training" My ESA is an Emotional Support Dog "No Training Needed"
Image size should be greater than 500x500.